Our Company, resulting from a joint partnership of SMEs specialized in the development of metrology and high precision tools, aims to provide manufacturers and system integrators with instrumentation, expertise and approvals necessary to address the most demanding markets in satellite navigation. 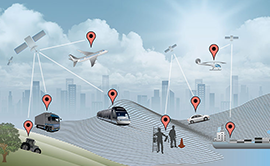 GUIDE is specially equipped to test the toughest GNSS solutions (Hardware, Algorithms, Receivers, Systems), either by simulation in the laboratory or live testing in real situations : urban areas, roads, rail, in the water, in the air. GUIDE pools the collective know-now of all its members to provide the best expertise in response to customer expectations. The founding members are all recognised GNSS specialists. a. Metrology (Legal). This aims to conduct perfectly controlled tests run according to methods from recognised laboratories or from standardisation committees. c. Understanding Criticality issues. This area covers integrity measurement as well as the validation of solutions which claim to conform to legal requirements. Validate or certify the performances of geolocation systems, especially for security and liability functions for critical applications. Provide metrology expertise in the field of geolocation with a strict independence and framed by ethical rules of the profession. Evaluate performances and select industrial solutions, from the design to the maintenance in operational condition through the qualification of prototypes.